An osprey on its nest is an imposing sight. 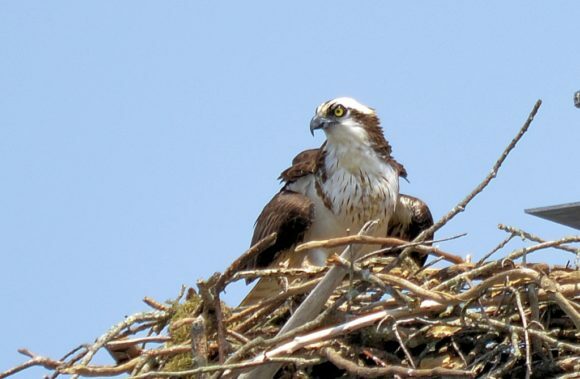 Late March into early April is when the Osprey returns to Connecticut from its southern wintering grounds. It is a wonderful sign that spring is finally here. The Osprey is a large bird of prey with a 4’6” to 6’ wingspan that eats only fish, hence, it is sometimes referred to as the Fish Hawk. Ospreys migrate south for the winter months to areas where their food supply will not be affected by frozen rivers and lakes. They settle down in the southern US, Central America, South America, and have been seen as far south as Argentina. Ospreys of breeding age are returning north now, to start a new nest or to re-establish a nest they may have used in previous years. There are many Osprey nests along the lower Connecticut River, from the mouth of the river in Old Lyme/Old Saybrook up river as far north as Middletown. There will be activity on the many man-made nesting platforms at the Roger Tory Peterson Preserve in Old Lyme and on other platforms located along the Connecticut River, in “natural” tree settings and on the top of each of the large navigation aids that mark the river channel. A great way to see this nesting activity is by boat. RiverQuest, an eco-tour vessel located at Eagle Landing State Park in the Tylerville section of Haddam is offering several cruises to the general public throughout the month of April to view and learn about the Osprey and other wildlife that may be spotted, including hawks and another famous raptor, the Bald Eagle. After disappearing from Connecticut in 1948, the Bald Eagle has made a return and there are several active eagle nests on the river. Two of these nests will be visible from RiverQuest and we will most likely see one or more of our resident Bald Eagles. Other areas of interest that will be seen on our cruise include the Goodspeed Opera House, Gillette Castle and the Chester/Hadlyme Ferry. The cruises are approximately 2.5 hours in length and cost $40 per passenger (no children under 10-years-old.) There are binoculars on board for loan during the cruise and complimentary coffee and tea. To learn more about these informative cruises and to reserve your spot with our easy on-line booking, please visit: ctriverquest.com or call the RiverQuest phone: 860-662-0577.